Disney's films have become so successful they're now the company's greatest competition. But George Lucas and Stan Lee know the answer: building your own universe. Disney’s feature film success is one of the great business case studies of the 21st century. In addition to releasing the top grossing movie in 2015, 2016, 2017 and 2018 (and 2019 is almost assured with The Avengers: Endgame and Star Wars: Episode IX both due). Disney also took home all of the top five slots in 2016 (the first time this has ever been achieved) and captured six of the top ten in 2017 (another record). In the last decade, only 29 films have crossed the $1B mark globally, 16 of which come from Disney – with half of those films released during the past two and half years. Nine of the ten largest opening weekends in US history now belong to the House of Mouse, as does roughly 25% of the box office (again, a record) – even though Disney releases only 10-12 of the 700+ films released each year. And thanks to this dominant performance, Disney now commands a substantially higher share of ticket revenues from theater owners than any other film distributor (as much as 65% for The Last Jedi compared to the traditional 50-57%). As a result, the company is believed to hold nearly 30% of the industry’s net receipts. Few expect Disney’s out-performance to change anytime soon. These box office achievements are the product of virtually unending excellence. This includes M&A (Pixar, Marvel, Lucasfilm), creative (no Disney film has scored below an A- CinemaScore since 2015, even as other major studios struggle to have half their slate rate at such levels), narrative innovation (the cinematic universe model allowed Disney to release two to three “sequels” per year, rather than one every two to three years), and committment (Disney’s willingness to spend more than $100MM each on reshoots for Rogue One: A Star Wars Story and Solo: A Star Wars Story to improve their creative is an industry rarity; other studios would have taken their chances with what they had). Supporting all of this is Disney’s film strategy, which was contrarian a decade ago but has since become the gold standard for the Big Six Studios. Under Disney’s model, only eight to ten films would be released annually (versus the historical Bix Six average of 20+), each of which would have a massive budget but even larger audience appeal. This strategy puts more money on the line, but derisked this investment by focusing it only on content that could reliably persuade audiences to turn off Netflix, get in their cars, drive to a movie theater with convenient showtimes and available seats, park, buy $10 tickets, sit through commercials and trailers as the adjacent seats fill up with strangers, watch the film for 150 minutes while holding off the restroom, then return to their cars and drive home. This is a phenomenal slate – so phenomenal that it must scare not just Disney’s competitors, but Disney itself. Traditionally, studios have feared three things: their competitors’ release dates (which cannibalize audiences and marketing awareness); overestimating the appeal of a film (which leads to overinvestment in production and marketing budgets); and creative failure (which hurts reviews and ticket sales). This year, Disney’s greatest competitor is Disney. The enormous success of Black Panther (which is on track to comprise 6%+ of all tickets sold during 2018) likely contributed to the disappointing performance of Disney’s A Wrinkle in Time, which released only three weeks later (tracking for 1% of tickets sold). Infinity War (another 6%+), which had the largest domestic opening of all time and essentially sent every Black Panther viewer back to the theater a second time in 10 weeks (with many going back for a second and third viewing), will likely affect Solo (which has seen opening weekend estimates plummet in the two weeks preceding its release, suggesting intent to view was high but has since moderated). And only three weeks after Solo, Disney will release the long-awaited sequel to The Incredibles (3%). Just as a strong Solo opening would harm The Incredibles 2, the latter film’s success would undermine the former’s (Star Wars films have historically had exceptional legs at the box office). Disney’s need to push the live action adaptation of Mulan from Week 44 of this year until Week 13 2020 was a disappointment to fans of the animated classic, but will likely benefit The Nutcracker (also Week 44), Wreck-It Ralph 2 (47) and Marry Poppins Returns (52). Despite this, 2018 still looks claustrophobic – as does 2019, the year Mulan has skipped outright. Running into your own films is a new problem, and one unique to Disney today. Historically, a major studio slate was comprised of a variety of films targeting different genres and viewers. As such, overlapping release didn’t necessarily mean audience cannibalization. But Disney’s films all target the same audience: everyone. In decades past, studios were also expected to deliver a handful of winners and losers; casualties were accepted as an inevitability. However, Disney’s benchmark for success is now based around consistent performance. Furthermore, the threshold for that success isn’t just achieving profitability – it’s hitting something close to $200MM+ domestic and $500MM abroad. This makes releasing a would-be blockbuster near another blockbuster far more dangerous than it was when films needed only $50MM to generate a profit. 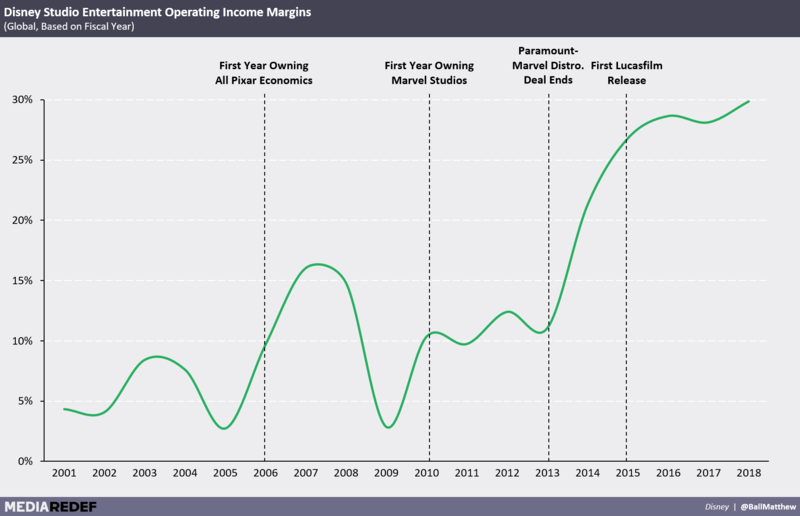 Still, it could be argued that with only 25% market share, Disney can still steal tickets from its competitors rather than just itself – 25% may unprecedented in film, but it’s far from the dominance achieved by market leaders in other industries. What’s more, Disney is the first studio in the modern era to crack 20% in the first place, so what’s to stop it from even greater heights? Yet, even if each of Disney’s ten releases in 2018 went on to become the ten highest grossing movies of the year, domestic market share likely would max around 32% (Disney’s share was 26.3% in 2016). 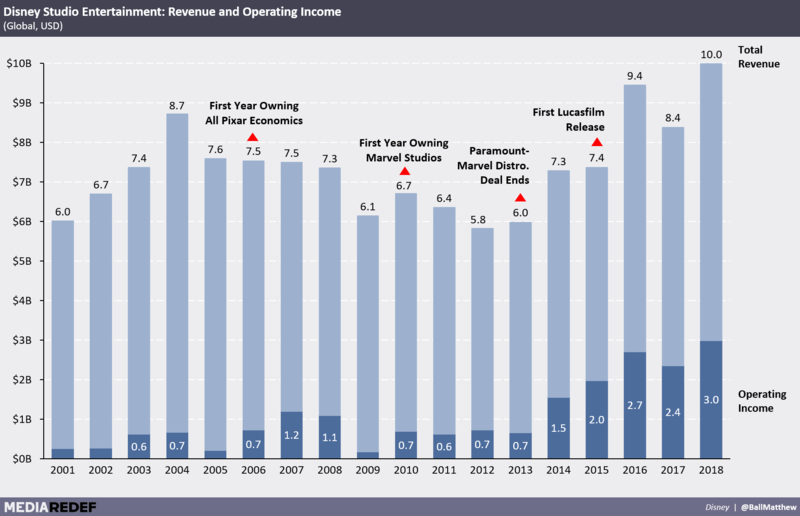 And Disney must still contend with several major releases from other studios – a challenge exacerbated by their replication of Disney’s tentpole strategy – each of which fight for market share and further crowd out release dates. Infinity War’s box office haul, for example, was limited by the release of Deadpool 2 (21st Century Fox) three weeks later – which also launched one week before Solo (further explaining the latter film’s declining estimates). 2018 will also see Jurassic World 2 (Week 25, Universal), Mission: Impossible – Fallout (Week 30, Paramount), Venom (Week 40, Sony), The Grinch (Week 45 , Universal), Fantastic Beasts: The Crimes of Grindelwald (Week 46, Warner Bros.) and Aquaman (Week 51, Warner Bros.) And if Disney acquires Fox, the company will face even more intra-studio release date conflicts – even if the total number of films released by the two studios declines. Disney’s ability to create high-capacity, high-quality films likely has become too great for the market to safely absorb. The biggest constraint Disney faces isn’t internal, but external. And this is what makes its over-the-top, direct-to-consumer play so significant. Unless the House of Mouse wants to restrain its creative output, it needs to release its content through a channel with different audience dynamics and where Disney is in total control of what works and doesn’t (it doesn’t help that theatrical ticket sales have been in decline for nearly 20 years, either). On SVOD, there’s no volume of content that over-saturates the channel, no release date that’s crowded out and, assuming creative execution, no title that will fail simply because it has a soft three-day opening weekend. Most important, each incremental release will drive subscriber additions, increase engagement and differentiation, and, more important, push up pricing power and derisk theatrical releases. No cannibalization required. Which is to say, Disney’s D2C play not only allows the company to capture more value from its existing business and products, it allows it to grow beyond the confines of its existing distribution channel. 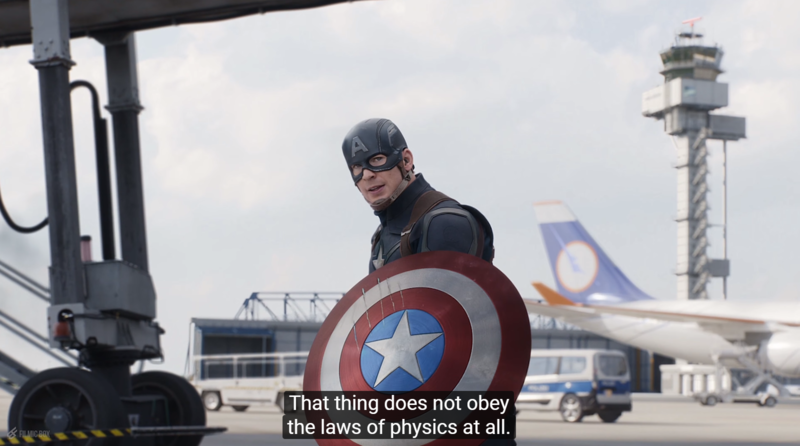 Disney is uniquely positioned to do this specifically because it has too many mass market films – no other studio has the IP, execution and volume today to launch a purely self-supplied subscription video offering. At a more macro level, Disney’s unprecedented content problem speaks to the company’s unique positioning in 2018. Shifting from a B2B to B2C business model is incredibly tough and, at Disney’s current scale, would represent one of the most significant business transformations in modern history. Still, the D2C SVOD vision is seen as a largely incremental shift for Disney – for all the change, it’s mostly about moving content from one channel/screen to another. What’s truly exciting is how it unlocks the ability to do new things, from economically scaling output beyond convention to offering a subscription service that could start with video, but come to include everything from comics to consumer products and theme parks. Disney, after all, loves to do what no one else can. Matthew Ball is the founder of REDEF Originals and can be found at @ballmatthew or mb.ball@gmail.com.